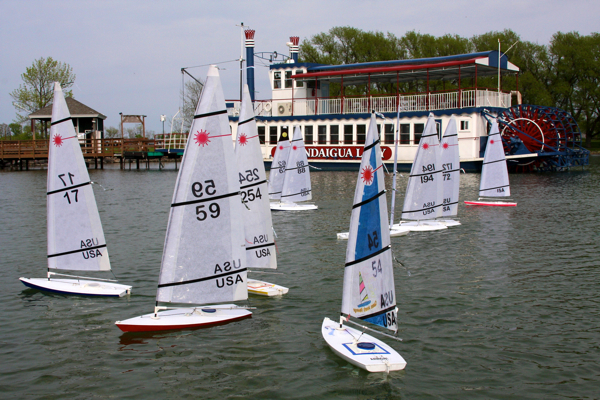 The sailing instructions have been posted for the 2012 RC Laser North American Championship Regatta in Canandaigua, NY on June 8-10. Online registration will be operational until noon on Thursday, June 7 and then anyone still needing to register can do that when they get to the venue on Friday. Only cash and checks can be accepted at the venue. After today, the registration fee goes up by $30 so if you are planning on coming and haven’t yet registered, save the money and sign up today! When you arrive at the venue, park on the east side of the building by the large white tent. We are using the tent to store boats, to serve lunches, to provide shelter from any bad weather if needed and for you to pick up your registration packets. You can bring your boat and sailing gear from your vehicle to the tent and we’ll have volunteers keeping an eye on everything while you compete. Registration and packet pick-up starts at noon. When you arrive, set up your boat with your sail so that we can photograph each skipper and their boat for the “Deckorations” contest. Friday’s races will be considered a “Championship Seeding Regatta” and we’ll have some fun prizes to award at the happy hour after racing. The results from Friday will be used for seeding purposes for Saturday’s start. We have a lot of sponsors for the weekend activities but Friday night’s happy hour is sponsored by BlackHeart Rum and they will have people providing samples their products. The Canandaigua Yacht Club also is providing funds so that we could have live music that evening. The voting for the boat decorating contest will begin on Friday night too. It should be a great time and that’s just a taste of what’s on tap for the first day! Stickers. Ben Franklin. RC Lasers. Vinyl. Markers. What?